The new Jeep Cherokee SUV Diesel is a good-looking off-roader that’s fun, comfy and full of life. It’s not quite the all-rounder, but it’s got bags of heritage and makes perfect sense for outdoorsy families. Indeed, if you’re looking for a car that your family can rough it in hassle-free, the Cherokee has a lot going for it. Its off-road abilities are impressive, but it’s also not too shabby on the tarmac. It comes with the option of four-wheel-drive, and can return up to a 53.3mpg economy. OSV takes a closer look at what it’s all about with our Jeep Cherokee SUV Diesel review. Jeep never intended for the new Cherokee to be super entertaining. Instead, it’s more what you’d call comfortable and cosseting, with some excellent off-road ability thrown in. The suspension is nice and soft, while its high ground clearance, tall body and four-wheel-drive enhance its off-road prowess. There are some criticisms. The steering is vague, and there is a fair amount of body lean in bends. Moreover, there are better off-roaders that are equally as good on the road. This one is okay on the tarmac, but certainly, nothing to write home about. An SUVeet 9-speed automatic transmission is standard on all models except the 2.0-litre diesel. In fact, this entry-level model is the only one that comes with the manual stick. Its gearshift action is precise and light, but the automatic ‘box is faster and smoother. Still, there’s no need to discount the 2.0-litre diesel engine. It produces up to 138bhp, and can be specified with either four-wheel or front-wheel drive. It’s the cheapest model to run – but it does lack oomph, doing 0-62 in 10.9 seconds. Worse still, you actually get penalised if you add four-wheel-drive. Not only will it cost more to run, but that 0-62 time is cut back to 12.0 seconds. The 2.2-litre diesel engines arguably look more attractive. Both are paired up with the 9-speed automatic, and one develops 182bhp while the other produces 197bhp. Both come with four-wheel-drive, and both feel strong and capable. They’re a bit noisy at start-up, but they quickly settle down. The 182 variant will probably be enough for most buyers. It does 0-62 in 8.8 seconds, with the 197 version doing it in 8.5 seconds. Really not much difference. Neither is there much difference between those two and the V6 petrol engine. We’re not reviewing the petrol engine here, but for argument’s sake let’s take a quick gander at it. Certainly, a V6 sounds bigger, brasher and better. But this 3.2-litre 266bhp power plant does 0-62 in 8.4 seconds and isn’t any better to drive than the diesels. Despite being a rugged off-roader, Jeep has put plenty of effort into making the interior as attractive as possible. We’d probably even go as far as calling it homey. It’s a pleasant place to spend your time on the road (or off it), with good levels of standard kit and comfy seats. The dashboard is nicely laid-out. Boasting a smart design, it comes with a new 5” touchscreen infotainment system that’s easy to use. Lashings of crime hike up the quality factor, while the materials used are solid and nice to touch. We wouldn’t go as far as saying that it’s a premium product, but there isn’t much to fault at this price point. Thanks to a 591-litre boot and sliding rear seats, the Cherokee is super usable. Slide those rear seats forward and you can extend the boot to 714-litres. That’s competitive in this class. Fold the seat and you can increase the boot to 1,267-litres. The low lip is highly welcome. Visibility is good, thanks to the high ride height, but legroom is a bit tight in the rear. No one will have any issues with headroom, though, but interior space on the whole is disappointing when you consider how big the car looks on the outside. Standard kit is good across the range. 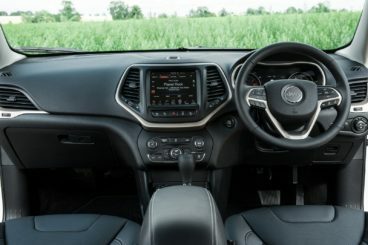 The entry-level model gets the aforementioned 5” touchscreen infotainment system, Bluetooth connectivity, and a DAB radio. It also comes with rear parking sensors, 17” alloys, and cruise control. The Longitude+ model is even more attractive, and adds a bigger 8.4” touchscreen system. It also adds sat nav, and a cool 9-speaker stereo. The Limited trim adds a bit more meat to the bone with 18” alloys and leather upholstery. But it’s the reversing camera that will prove the most useful addition. The luxurious Overland trim rounds things off with snazzy Nappa leather seats, better carpets, and a leather dash. In terms of safety, you don’t need to worry about the Jeep Cherokee. It bagged all five stars when Euro NCAP crash-tested it, and standard safety kit is packed. It includes electronic stability control, antilock brakes, airbags, as well as a tire-pressure monitoring. Prices for the new car start out from £32,700 and rise to £42,500. For more information on our lease deals, check out our page here. In terms of its running costs, the Jeep Cherokee is hit and miss. It’s worth remembering that this is a hefty car, and was never going to be super affordable to run. But as long as you don’t have high expectations, the diesel models should fit into your budget. Opt for the front-wheel drive version of the 2.0-litre 138bhp diesel and you’ll be happy enough. It can return 53.3mpg, and costs £130 a year to tax. Four-wheel drive bumps up the costs, sending annual road tax to £145. The 2.2-litre diesel engine comes with a more efficient 9-speed automatic ‘box, and can return 50mpg in either power guise. The yearly tax bill is £145. The bigger V6 petrol is much harder to recommend. That said, if you’ve got the cash to splash on the TrailHawk in the first place, perhaps running costs aren’t a massive issue for you. It can return around 30mpg at best. Even in when roughing it in the mud, the Cherokee looks good. The entry level model is well kitted out, and comes with Bluetooth, a DAB radio and cruise control. Not only does it shift smoothly, it also improves efficiency. The diesel engines are the most affordable, but 0-62 in 8.8 seconds is a tad slow. The TrailHawk model boasts a V6 petrol engine and some snazzy interior touches. But it’s damn pricey. 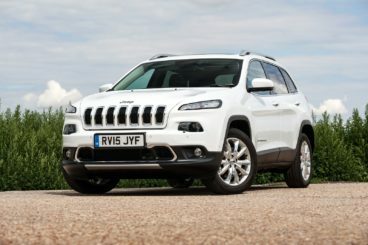 Let’s see how the car fares against its rivals in the comparison section of our 2017 Jeep Cherokee SUV Diesel review. The new Volvo XC60 has been waiting for its moment of glory for quite some time now. Thanks to a stylish but comfortable interior and heap of standard kit, that moment may have finally arrived. Sure, the XC60 isn’t much fun. But its demographic are business people and families who want a stylish, hassle-free driving experience. Also, its turn of speed is decent and nothing to be ashamed of. Even better, four-wheel-drive is standard, and there’s lots of grip. Downsides include artificial steering, inert handling, and a rather tall height. Further, the standard suspension is a tad stiff. When it comes to picking a diesel engine, you won’t need to choose based on the economy as they all return similar figures. Instead, you’ll take your pick based on speed. The D4 opens proceedings. It delivers up to 187bhp, and does 0-62 in 8.4 seconds. It’s hardly slow, but for more pace the excitingly-named D5 PowerPulse does it in 7.2 seconds. It’s backed by some impressive tech to that boosts acceleration. There is also the option of a petrol engine. It’s a turbocharged 2.0-litre unit that develops 251bhp, and which can get you from rest to 62mph in 6.8 seconds. On paper, it’s quicker. But in the real world, the D5 actually feels quicker. A T8 plug-in hybrid rounds things off with its 403bhp and a 0-62 time of 5.3 seconds. That’s fast, but it’s not actually available just yet. As such, we don’t have its mpg numbers. For now, the D4 and D5 are the cheapest engines to run, returning 54.3mpg and 51.4mpg respectively. Inside, Volvo’s have never looked or felt as good as they do right now. This Volvo XC60 has borrowed much of its tech and trim from the XC90, but it still looks smart. Comfort is excellent, as is refinement. The levels of tech are high, too. A 9” touchscreen rivals Tesla’s portrait-style infotainment screen, and includes climate control, stereo and sat nav controls. This is a big car, which means plenty of interior space. But while there is plenty of room for five occupants, the boot measures just 505-litres of space. That’s a lot smaller than the Jeep, and a lot smaller than Volvo’s of old. The premium, stylish design is a major reason why the boot has got smaller, but it’s still usable. It can be increased to 1,432-litres by folding the rear seats, and comes with a powered tailgate. The new Honda CRV is a solid family car. It’s sturdy, comfortable, and gets on with the job without being showy. 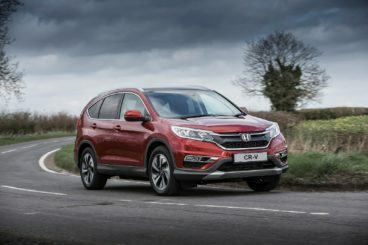 There isn’t much to shout about when it comes to its driving experience, with the CRV designed to be as comfortable as possible. There is plenty of grip, though, while the two-wheel-drive model is both agile and nimble. The four-wheel-drive variant is number and less responsive, while body lean is excessive. Its 9-speed automatic transmission is hard to recommend, too. In terms of the engines, the 1.6-litre 118bhp diesel is the standout choice. It’s hushed most of the time, and does 0-62 in 11.2 seconds. That’s reasonable, although you’ll find yourself SUVitching gears a lot to keep up. We think you’ll love the 6-speed manual ‘box, though. A bigger diesel engine is available. But while it does 0-62 in 9.6 seconds, it’s costlier to run. It’s the same story with the sole petrol engine. It’s sprightly, and takes 10.0 seconds to complete the 0-62 dash. But returns of the 39.2mpg economy are hardly family friendly. Our favourite diesel engine, conversely, is good for a 64.2mpg economy, and costs £160 to tax in its first year. Inside, the Honda CRV is hit and miss. Don’t get us wrong – this is a well-built cabin. But it’s beginning to look its age. Worse still, some of the plastics are low rent. However, an SUVooping dashboard is nice to look at. It scores well on the practical front at least. There is plenty of interior space, and both head and legroom are good. The absence of a transmission tunnel is a real bonus, too. Storage spaces are everywhere, and include a trio of cup holders and a massive glovebox. The boxy shape of the car, meanwhile, ensures the boot will be well-sized. And at 589-litres, it really is. It’s a tall boot that extends to 1,669-litres when you fold the rear seats. Thanks to Honda’s Magic Seats, this is easy to do. The Cherokee is oddly positioned. 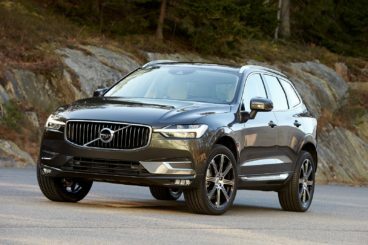 Its rivals include the Volvo XC60 as much as they do the likes of the BMW X3. As a standalone, it’s pretty much in a niche of its own. If you like being different, that’s good news. The new Jeep Cherokee SUV is eager, packed with lots of neat equipment, relatively affordable to run, and can muck in with the best of ‘em in the mud. We like!